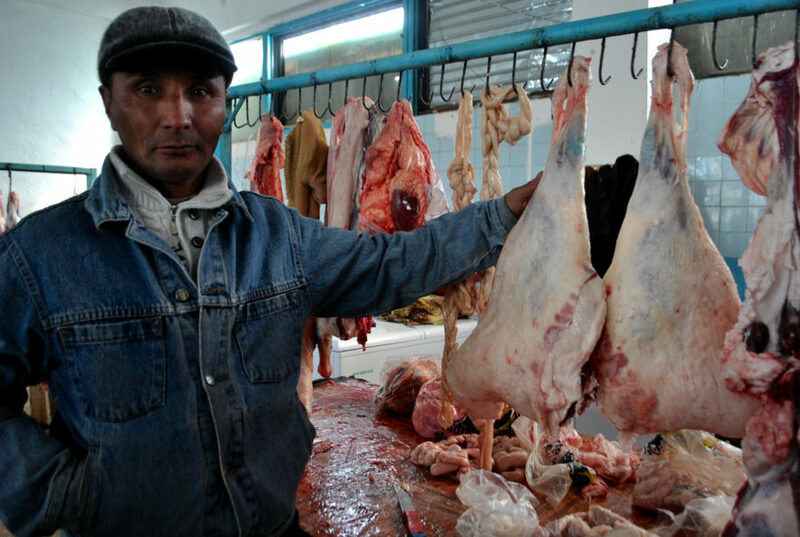 A butcher in Kyrgyzstan. 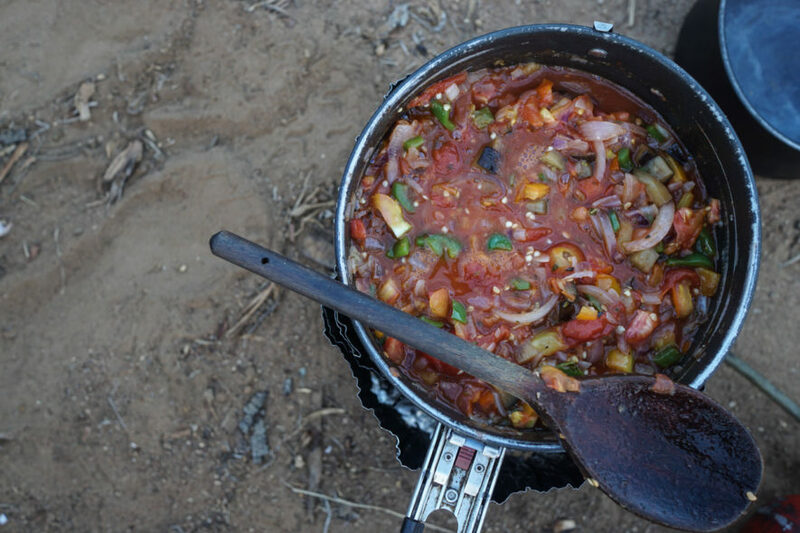 Like Kenya, Kyrgyzstan is home to enthusiastic omnivores. 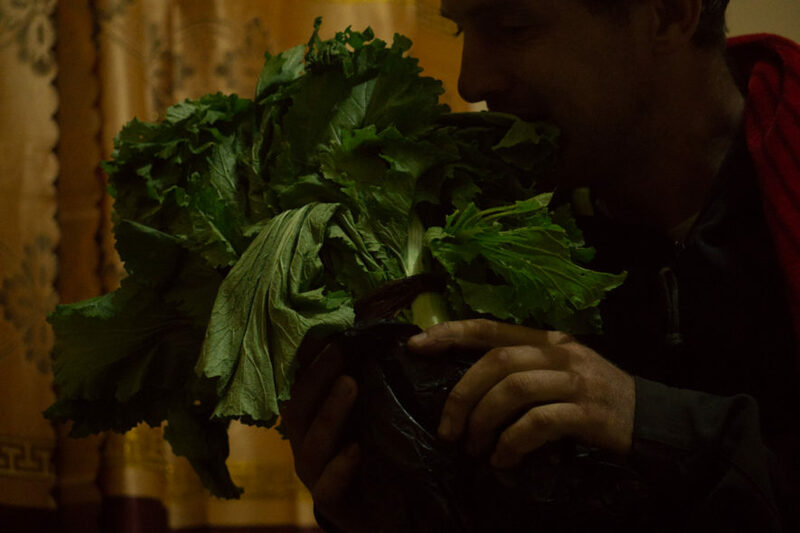 Kyrgyzstan is where we decided to try a vegan diet. Reflecting on the pros and cons of our aspiring veganism, and how it fits into a bike-travelling lifestyle (1,900 words). And I tell them yes, I know of their famous roasted meat and I’ve even tried it. A wooden block piled with goat flesh has been thunked down in front of me. I’ve torn the fat and gristle off the bones with my teeth and fingers and used these greasy fingers to fumble my way through the accompanying ball of corn meal dough, ugali. I’ve told the Kenyans that their nyama choma is delicious, because that’s how it tasted to me. So perhaps these days I am a Kenyan vegan, as Kenyans seem to not only expect but embrace exceptions to the rules. One and a half years after deciding to try veganism, I find the arguments for a plant-based diet even more compelling than I did in 2016. At the same time, I’ve gradually re-introduced more dairy and meat into my diet during this year of bicycle travel in East Africa. This feels less contradictory than it once did, but in this post I don’t shy away from the ways there remains a chasm between where I am and where I’d like to be. As we are often reminded, few vegans are truly vegan. Field mice killed during grain harvesting, the problem of honey, flies in the soup are all familiar trump cards. The duck, geese and cow graveyards sewn into our clothing and gear are yet other ways that inconsistency is difficult to avoid. These arguments generally serve to cut down the ambitions of vegans, particularly when there’s a self-righteous one at the barbecue—who let them in?! 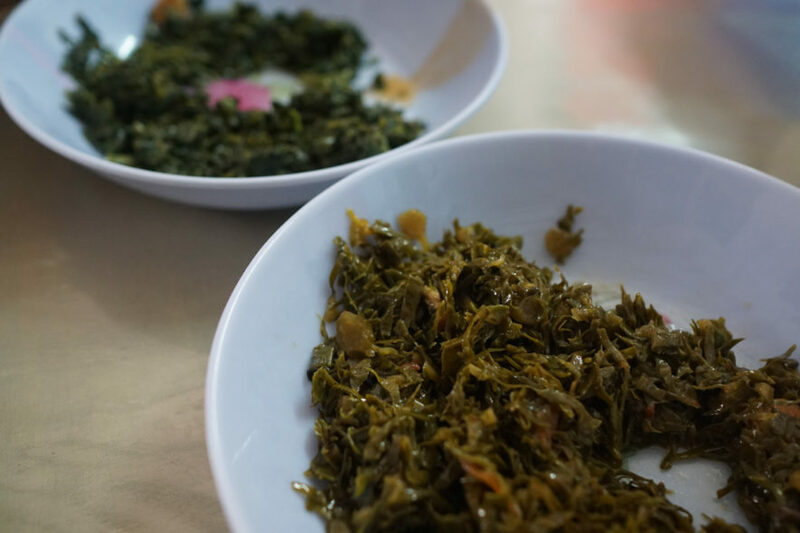 In Kenya, spinach and kale are commonly stewed with meat-flavoured cooking cubes. Vegan? 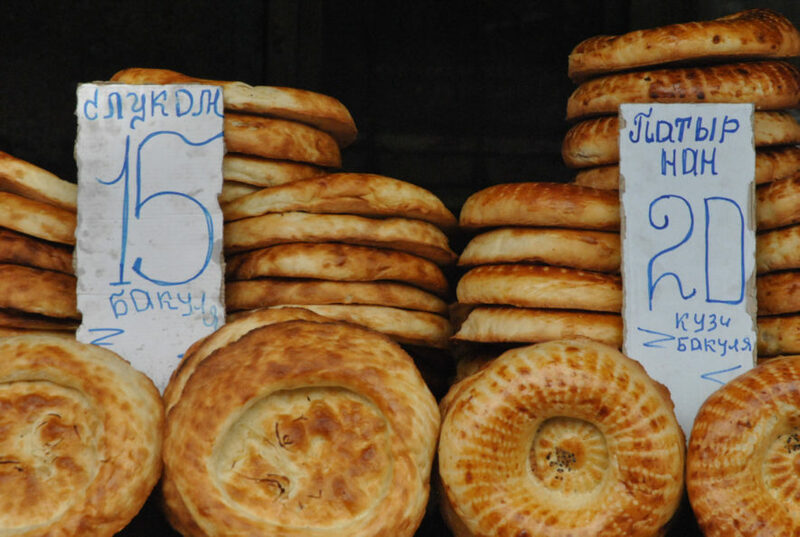 Bread, nan, in Kyrgyzstan. I suspect that not all bread is completely plant-based, and it can be hard to figure this out while travelling! I rarely even brushed the top tier of vegan aspirations. We decided to go vegan in Kyrgyzstan, and when eating out simply asked for our laghman noodle soup to be without the meat, in terrible Russian. This was little more than don’t ask don’t tell. The line in the sand was always shifting and generally it was only to appease myself. In summer 2016 I was in Canada, where my friends and family accommodated my new ideals graciously. It was me who justified one Timbit, then one single sour-cream-glazed donut, and then a gourmet omnivore meal at a bachelorette party, not wanting to burden the planners with my demands. And yet, if I had read another person’s account of stumbling, imperfect veganism like the one I’m sharing, I would have started down the road to plant-based nirvana much earlier. Even vegetarianism I had written off, intimidated by the ‘one strike and you’re out’ ethos that I perceived to be the norm. I think that all I can ever be is an aspiring vegan, and I’ll try to avoid shorthand and ID myself as such. Framing it as an aspiration also feels motivating, a reminder that it is a process. What is lifelong is rarely binary. We strive for integrity, patience, minimalism, whatever, we base our identity on them and we fall short all the time. What makes it easier to be candid about our failures—with ourselves and others—and to keep trying, is not that these ideals make up the identity we want to project, but that the ideal itself is exciting to us. Lunch in Uganda. The reason I am able to make as many plant-based choices as I do, is that I get excited to eat more vegetables. By the time Shannon asked if we were vegetarians, the ground beef was already sliding in its own juices down the styrofoam she tilted towards the skillet. So I said no, and ate what our host cooked for us, the flesh of a cow from her farm. Since becoming an aspiring vegan, when I choose to eat an animal product it’s for one of two reasons. Either I want it, or I want to avoid the consequences of saying no. Being hosted and turning down the food that is offered is something I’m generally averse to, with context: what’s the culture, what are the opportunities for communication, did I bring suitable food with me to this particular shindig? I guess others might say that even in different cultures, participating in meat eating would be to them like becoming an accomplice to murder, or something else wholly unacceptable. I acknowledge that perspective, but I don’t currently use it to guide my decisions. This implies that I value hosts’ feelings over the animal suffering I make myself complicit in. For now, I am okay with this. Aside from it being foisted on me, the reason that I sometimes choose animal products is long-term strategy. I don’t want to associate a plant-based diet with deprivation and resentment. I want it to feel like a choice. This has become particularly relevant while travelling. There are days on the road that the thought of yet more rice and beans makes me nauseous. Chickens be damned, I’ll eat an omelette if one is available. 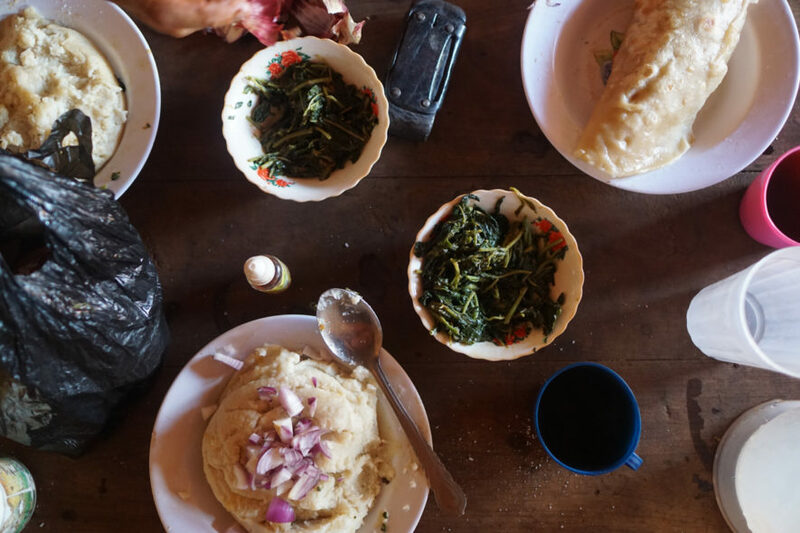 Maize meal and greens in Tanzania. Choosing vegan is a privilege. The reason that it is easy to find vegan meals in low-income countries is that many people can’t afford much else. These meals get bland and boring, but we try to remember that we have a choice to eat something else. What surprised me is how much of veganism is easy and fun during bike travel. 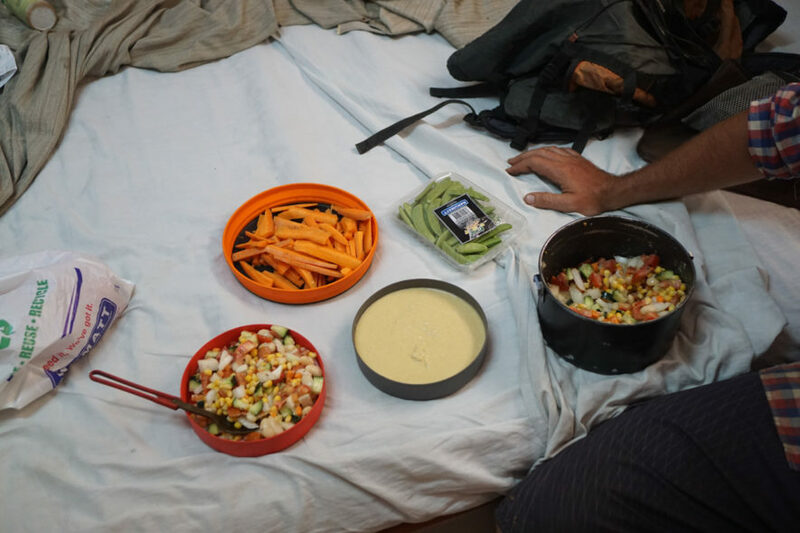 Most longer bike trips involve a stove and cooking equipment, lessening reliance on restaurant meals—the stove can be set up in hostels or guesthouses, not just at camp. You’re freer to eat what you want. In planning to cook often, no matter the diet, creativity with spices and ingredients becomes very appealing. The alternative is endless repeats of the same one-pot meal. Our stews and salads are colourful, mirroring the rainbow of fruits and vegetables stacked enticingly in markets. We’re motivated to cook them for health and also for the pleasure of shopping for them. 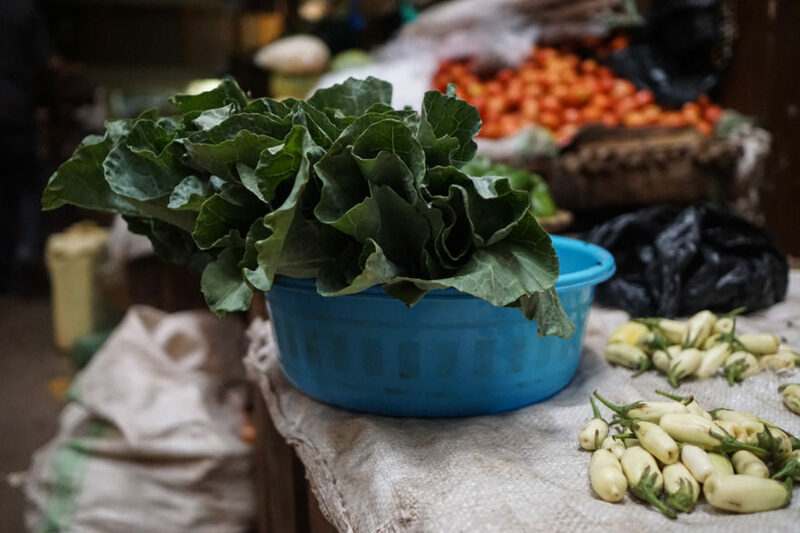 Exploring markets with a purpose beyond people watching and photography has become a travel highlight. And each new market offers another chance to find precious avocados, the filet mignon of a plant-based diet. 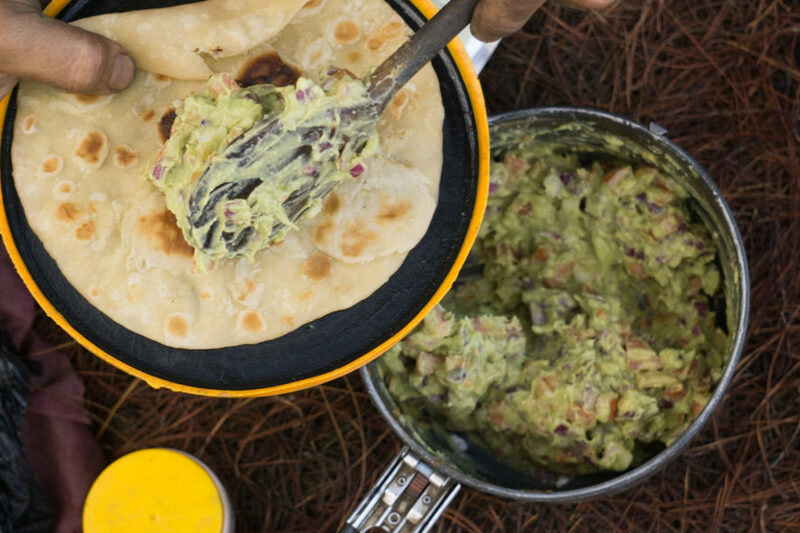 Guacamole in Tanzania. We carefully wrap the avocados so they don’t get smashed in the panniers. Vegetables at a Ugandan market. How beautiful, and exciting that this can be made into a meal. 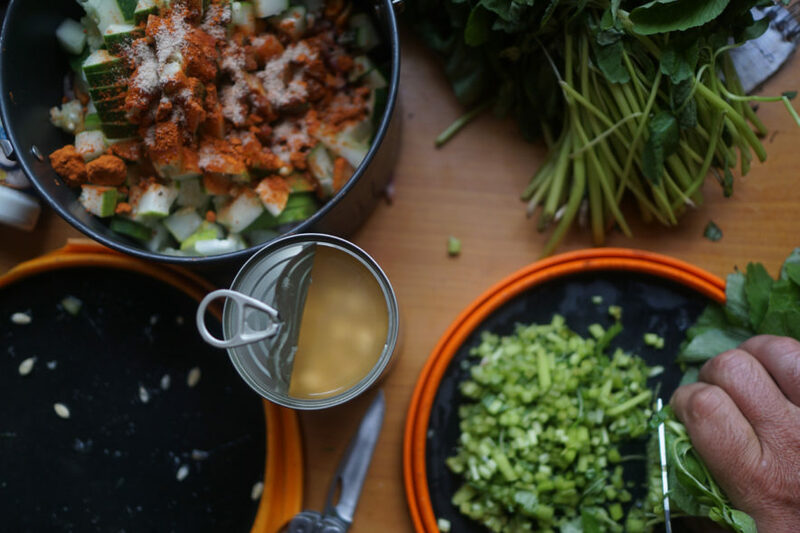 Vegan meals can also be less gross: when water and taps are scarce, it feels slightly more hygienic to pack away unwashed pots day after day when no dairy or meat was cooked. 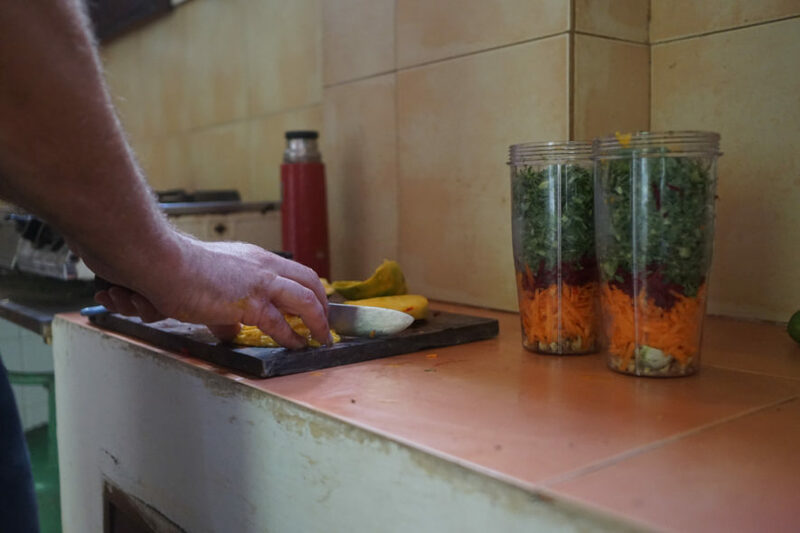 At peak enthusiasm we travelled with a little blender to whip up green juices and hummus—tahini included!— as we cycled through Kenya and Uganda. This was amazing, and because of the blender we probably ate more micronutrients and less animal products. After a few months, its blades did little more than pre-chew the gingery salads we stuffed into it, and the enjoyment of drinking them disappeared. We gave the blender away and haven’t replaced it. Going with the flow as did with the fall of the blender is only useful to a point. Even the habits I recognize as fun and beneficial generally back slide as soon as I think they’ll take care of themselves. In the rapidly changing circumstances of travel, the rationale that informs our choices tends to lag behind reality. My relationship with eggs illustrates this. I introduced eggs earlier in this post as an occasional respite from the boredom of more rice and beans, or ugali and greens, or a breakfast of only bread and fruit. We will have started eating them under these circumstances, where markets and restaurants offer little else. And then these delicious greasy omelettes will persist in our diets long after they’re needed to stave off boredom. The rationalizations flood in. 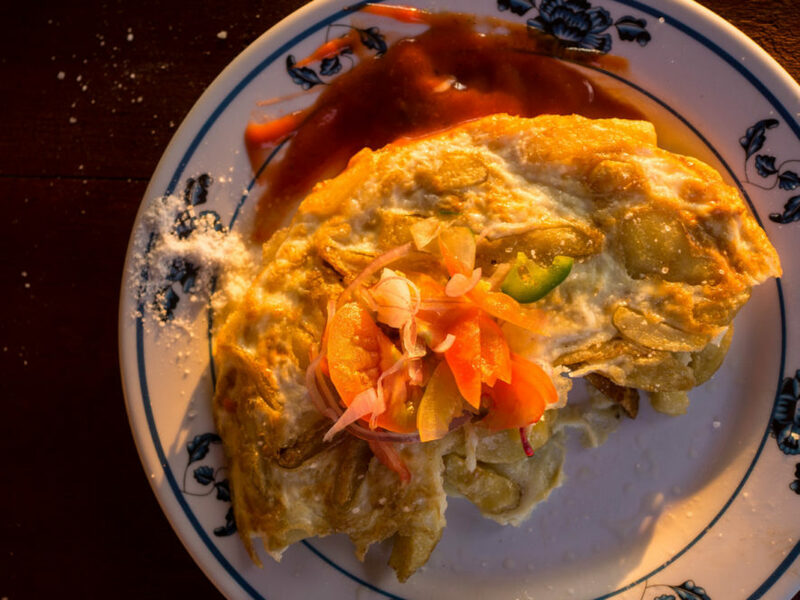 Chipsi mayai (chips omelette) in Tanzania. The chipsi mayai was a daily temptation throughout Tanzania to which we usually gave in. 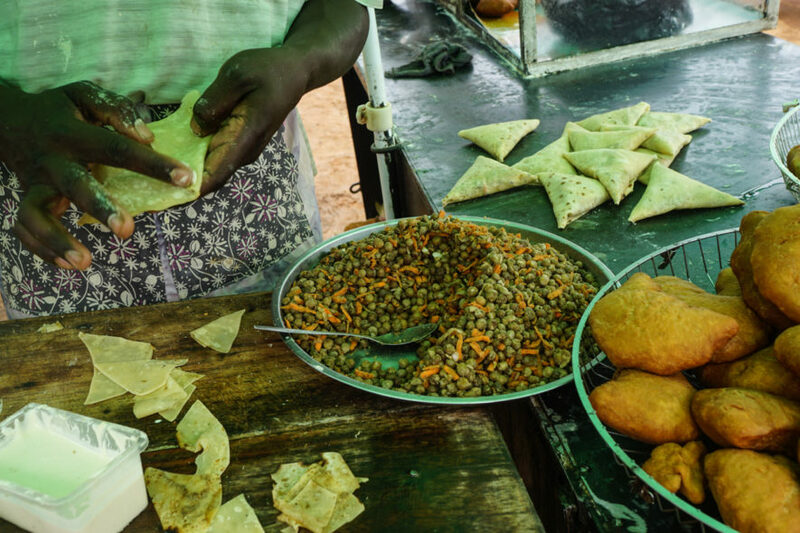 Vegan samosas in Uganda. 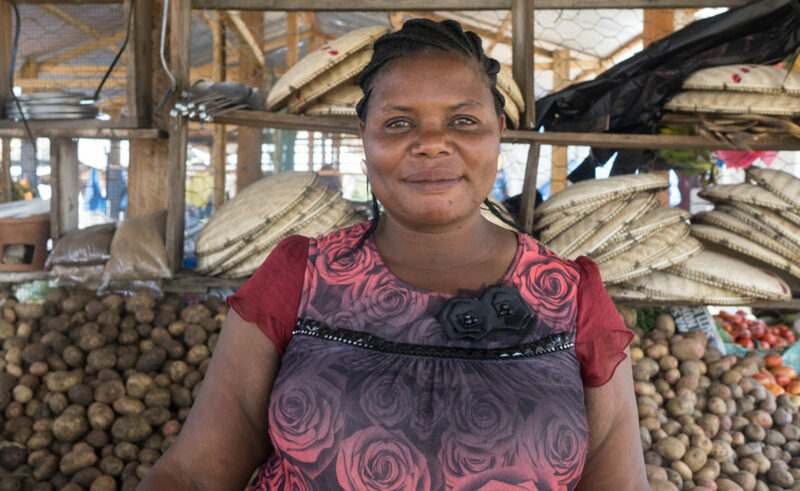 Uganda was the easiest country to eat a plant-based diet, with many suitable street food options. And yet we often chose the unmatchable ‘rolex’, an egg-chapati wrap. First is the idea that the most humane B12 in East Africa is via eggs. In truth, health stores with B12 vitamins exist in several capital cities, from Nairobi to Lusaka. I’m chuckling, because I know why I haven’t replenished my stocks of B12 after running out. At one point the container opened in my pannier, and many of the tablets got damp and smelled like something forgotten in the back of a refrigerator. Those kind of associations tend to stick around in my subconscious, especially when it’s expensive to replace the vitamins. I also tell myself that most chickens in developing countries have lives worth living. Debatable. A walk in larger markets confronts this assumption, where the ‘layers’ and ‘broilers’ alike are crammed into woven cages, half naked from pecking each other’s feathers out. In rural areas, the torture du jour is tying chickens upside down on the handlebars of bicycles for transport, their feathers and skin rubbed off as they bounce against the moving wheels. And lest I paint a picture wholly exotic to westerners like me, it’s 2017 and the factory farming of chickens is nothing new in several African countries. In the changing conditions of travel, the case could be made for the simplicity of strict rules, rendering the local context irrelevant. I guess it’s like any diet choice—some people do better in the long run with a militant approach, others with flexibility. Our groceries in Tanzania. Evan used to follow a raw vegan diet. This all-or-nothing approach made him abandon plant-based eating completely when he began bike travelling, because it was all or nothing to him back then. There’s always complacency and faulty assumptions eroding progress. Despite this, my baseline has gradually moved in the direction that I wish it to, and may well continue to with my chosen combination of questioning my choices and being kind to myself. Not so long ago, I could not imagine book club without cheese and wine, brunch without bacon, breakfast without yogourt, pub night without nachos, or a week without meat. Today, these sacrifices no longer feel like sacrifices—most of the time. And so presently I eat eggs and drink white coffee by choice, and accept invitations in from the road without always sharing my aspiring veganism. The hope is that gradual changes that are also flexible have the best chance of lasting my lifetime.